Did you foolishly think that the guided missile was the most OP Fortnite weapon? Well, prepare to rethink that notion as something totally new arrives in Patch 3.5. In typical Fortnite fashion, it's ludicrous and amazing all at the same time -- Port-a-Fort. In this instance, "coming soon" probably means in this week's update, slated to land on April 12 (edit: it's out on the 11th, actually), but that isn't the official release date at this point, so it's possible this could be a Fortnite jet pack scenario, where we hear about it but don't actually see it for a long time still (seriously, where is that thing already?). This little guy is going to be a big game changer! Update: the Port A Fort has arrived, and we now have better details! It is, in fact, an epic purple drop that builds instantaneously and places you inside it if you throw it at your feet. The inside comes with tires for bouncing rather than stairs (adding a bit of Unreal Tournament jumping silliness to the combat). 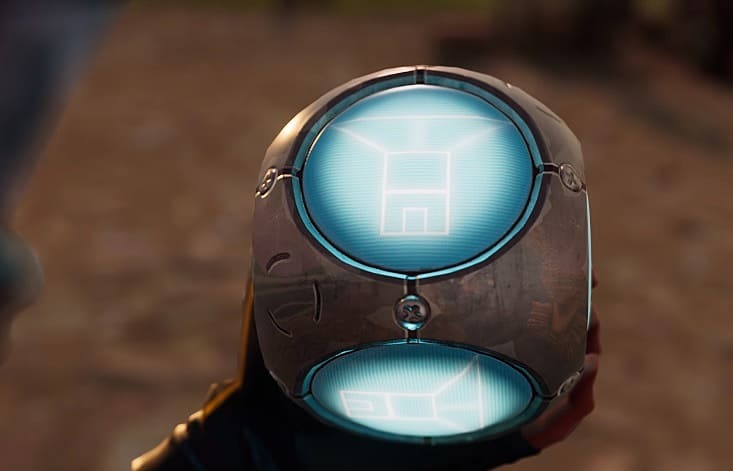 Previous info: We haven't seen any actual gameplay yet, just a teaser trailer with a cutscene, but that did seem to give a good indication of the standard fortification shape each Port-a-Fort will create (assuming there aren't multiple versions or options to change style before throwing the grenade). 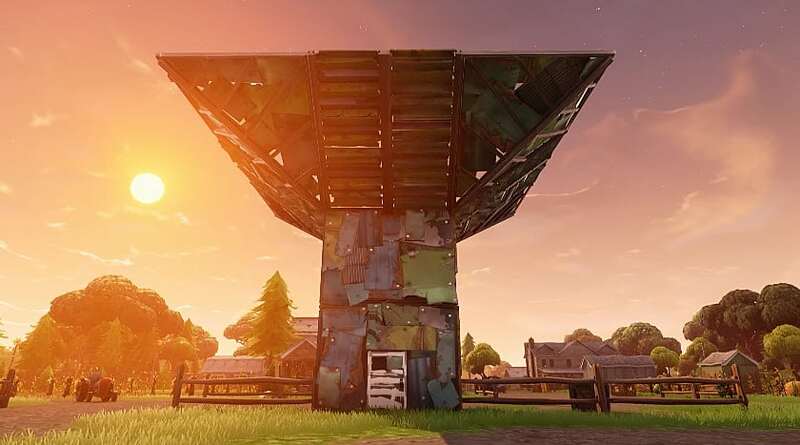 The basic Port-a-Fort creates a standing tower with an upside-down ziggurat-shaped roof for sniping and a front door ready for entering. Based on the height, presumably there will be a staircase inside, or at least some platforms sticking out for jumping up and down and using as cover. At this point, there are some big question marks over how the physics will work. Could we use it to knock people off cliffs and out of their base rooftops? Will it push you aside as it grows, or do you appear inside it or at the top? All these options will radically change how the Fortnite Port-a-Fort is used and what the best strategy will be for offense and defense. 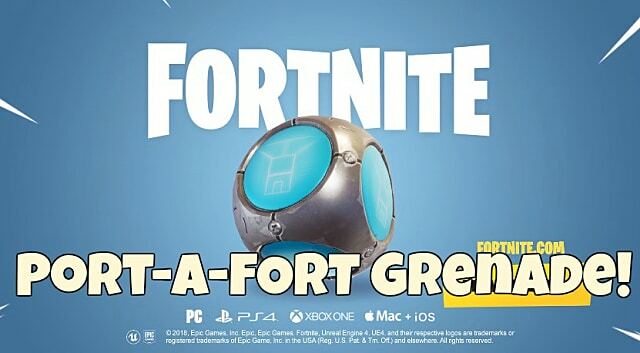 Obviously, it will appear in loot chests and floor drops, but the Port-a-Fort grenade's rarity is currently unknown. We'd have to assume that it will be on the upper end of the rarity scale in epic or legendary, as otherwise it could really unbalance the game and remove any need to harvest resources and learn how to build forts on your own. When it does finally arrive, the Port-a-Fort grenade is likely going to replace the bush item drop as the preferred method of staying alive and out of the line of fire. Who needs to be stealthy if you can have an instant fortification as soon as bullets start flying your way? Unfortunately, it remains unclear at this point if the Port-a-Fort will be a limited-time item or permanent addition (but if it works like the teaser indicates, we are hoping for the latter). Expect it to drop with Thursday's update as we enter Week 8 of Fortnite Battle Royale Season 3! New Fortnite loot drops like this one have been known to accidentally arrive early in a few matches from time to time, though, so if you've seen the Port-a-Fort in action, let us know all about it in the comments below! Oh, you thought I was stuck out in the open with no cover? Think again!